I don't tend to use terms like OMG, but when I saw this book my first thought was OMG! The reason for that is the size, this book is massive, 668 pages to be exact! It's so big that I actually considered NOT reading it, because of the time it would take me. But...this book is much anticipated, 4 years since the last book in the series Necropolis. As with a few other books that I have read this year, I was concerned that I wouldn't remember enough of the earlier books. There is a fair amount of recapping in this book, so that worked well. Also, I think that this book works on it's own too. The premise of the series is that there are 5 children who are the Gatekeepers, when they are together they are powerful, and together the can defeat the Old Ones, who are evil forces determined to destroy the world. 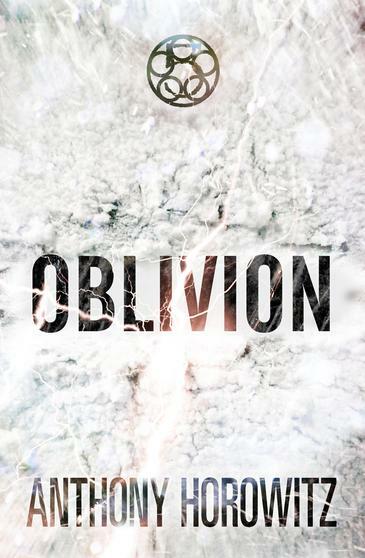 I the first 4 books, the five were finally in the same place at the same time, but only for an instant, and the they were thrown to the 4 corners of the globe, and 10 years into the future, this is where the story of Oblivion begins. Each chapter focuses on a different character, we learn where they have found themselves and the challenges that each person faces. The world is a very different place now, and the Old Ones have managed to almost destroy the earth as the 5 knew it. The 5 need to get to Antarctica. Not an easy task when Jamie is in England, Scott and Pedro in Italy, Scarlett and Richard in war torn Cairo and Matt and Lohan are in South America. Despite its size, it's not a difficult book to get through. Anthony Horowitz has a gift when it comes to writing hard to put down kind of stories. I think it has something to do with the fact that he writes for TV, it's that visual style of writing that can turn non readers into readers. This book is (in my opinion) borderline suitable for a primary school. There's quite lot of violence, blood being sprayed, execution style shootings and cannibalism. There's also something called becoming 'adjusted' which involves reluctant soldiers being modified for battle, this includes things like having arms cut off and replaced with saws and blades. I think it's probably on par with the other books in the series, so if you have those then this one shouldn't be a problem. Here's a couple of interesting clips, the first is Anthony Horowitz talking about his research in Antarctica and the second is a glimpse at what to expect from this book.